From Prot-On v3, Protection Policies based in templates complement the former approach document centric. The main advantage of policies is that changes in the policy apply to all the documents using it. Therefore, Prot-On v3 offers full flexibility to implement and maintain any kind of protection policy. Protection Templates consist of a matrix to grant permissions to user (or email addresses) or groups of users, plus the configuration of advanced properties: watermarking, number of devices, use offline, etc.). 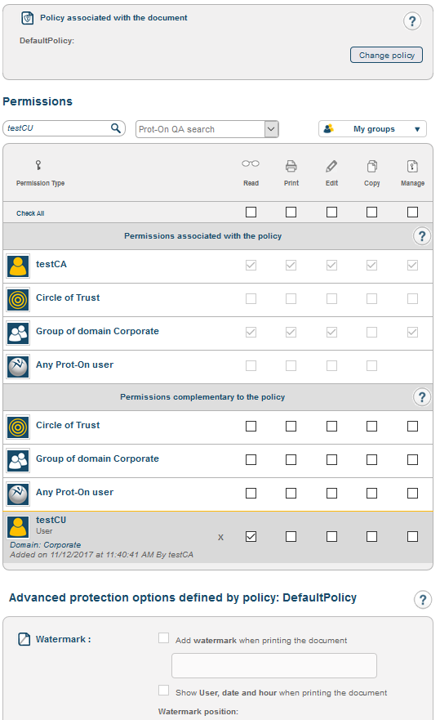 When a policy is applied to a protection the base protection is applied, then it can be complemented granting additional permissions to other users or group of users. When a Policy is applied to a protection, it can be complemented with specific permissions to users and groups, however the advanced properties of the protection (watermarking, time restrictions, etc.) will be the settled in the Templated and cannot be modified protection by protection. Any change in a Policy/Template, will apply to any document protected in the past which the Policy/Template applies to. The dynamic behavior of templates determines the meaning of the default configuration to apply to protections. Before Prot-On v3, changes in the configuration by default applied only to new protections after the change; with this new version changes apply to all protections done in the past which the Policy applies to. At any time we can choose the Policy to use by default, even we can decide to maintain the current default settings without using templates. The administrators of Prot-On domains can configure the default Policy of the domain users, even they can avoid the users to change it.